Do Acrylic Shields for Cat Claws Work? Declaw surgery has been outlawed in 22 countries in Europe. It was once a widely accepted practice to declaw a cat almost as a matter of course. However, as more and more voices spoke out against declawing it became clear that a more humane alternative was necessary. Fortunately, creative minds came up with a solution to common cat scratching problems. Acrylic cat claw covers are the humane alternative to declawing a cat. People declaw cats for a variety of reasons, but the most common reason is to protect furniture, walls, carpeting and door and window jambs from being scratched beyond repair. Cat's have a natural desire to stretch out and draw their claws along a surface in a manner that looks as if they are sharpening their claws. They do this for two reasons, neither of which have to do with sharpening claws. In reality, there are scent glands in the front paws that are stimulated when the cat moves in this manner, and cats are territorial creatures. The movement also helps peel off the outer, dead layers of the claws. All this scratching is destructive to household furnishings. Claws also can damage the delicate skin of old folks and babies, so some people resort to declawing in an effort to avoid these problems. Soft Claws and Soft Paws cover the cat's claws, obviating the need for a declaw surgery. They do not interfere with the cat's natural instincts or the performance of the claws in any way. There are two major manufacturers of acrylic claw covers for cats sold under the brand names Soft Paws and Soft Claws. They are available wherever pet supplies are sold, on the Internet and through many private grooming shops. Some cat owners prefer to apply them to their cats themselves while others rely on the expertise and services of a professional groomer or veterinary technician. Your decision as to whether to apply them yourself or pay someone else should be based on your own comfort level with such a procedure as well as your cat's personality. A fractious cat may be hard to handle and require the help of a seasoned professional. "We've had great success with Soft Paws in our shop," says Penny Milkins, a professional groomer at Canine College Day Spa in South Florida. "We like that we are offering an alternative to inhumane declawing surgery and that the product comes in a variety of colors which make them fun for the clients. We apply them right in the shop, or we can offer a lesson in their application if the client prefers." Virtually all of her clients who have used them return for re-application and are happy with their quality and performance. Both Soft Claws and Soft Paws come in a variety of sizes and are sold according to the cat's weight. They are applied with a specialized glue made specifically for use with cats. The process works best if there are two people, one to restrain the cat and one to apply the nail covers. The "holder" gently presses on the cat's paw which naturally unsheathes the nails. The applicator places a small drop of glue into the acrylic cover and slides it over the natural claw, pressing lightly for a moment to get a good seal. As with everything else, there are pros and cons, but the benefits far outweigh the risks. The glue is super fast setting and can bond skin and fur in an instant, so it's important to be very careful during application. The glue cannot be used interchangeably with other glues of its type such as Super Glue or Crazy Glue. The covers need to be replaced every four to six weeks. A kit usually includes 40 covers, applicator and glue, and lasts four to six months per cat. Cats do not seem to notice them and adapt very quickly to them. What Makes a Good Cat Scratching Pad? What Is the Personality of a Pomeranian? Can You Just Stop Using Prednisone in Cats? 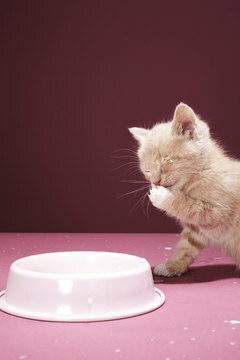 Is High Ash Content Dangerous to Cats?